What is your choice? The city, beach, or farmland? After experiencing so many different landscapes these last few weeks. The city is usually fast paced and has a hustle bustle type of feel to it. If you enjoy being surrounded by people, using public transportation and walking a majority of the time then you would be a fan of city life. Walking around in downtown Belgrade my senses are tested numerous times. For example, in a matter of minutes I can smell the bakery down the street filled with delicious pastries and then a few seconds later it smells like sewage. Bam! Just seems to slap you right in the face and wakes up your senses. After experiencing the fine dining, club life and walking off the pastries I just consumed my body is longing for the beach life. Spending time on the beautiful beaches Bosnia and Croatia had to offer I finally got to let go of any worries and relax. In the city you always have somewhere to be and have a schedule to follow but on the beach time is non existent. Beaches can be lined with rocky coastal lines, sand, or filled with pebbles. The beaches I experienced so far in Eastern Europe were pebbled and I advise anyone to buy water shoes. The warm sun on my back seemed to take all my worries away. The water was crisp and refreshing. You could see right through it, clear like the sky above me. The food was fresh especially the sea food which I am not a huge fan of but I will try everything once. Speaking of fresh food the farmlands of Serbia are filled with gardens of fresh fruits and vegetables. Along with that come naturally grown chickens and pigs. The family we stayed with made us lunch and I couldn't believe how red the tomatos were or how delicious the chicken tasted. It's funny because they don't label this as organic it is just a way of life. Growing up in the country must be nice when it comes to a slower pace of life and healthier food choices. 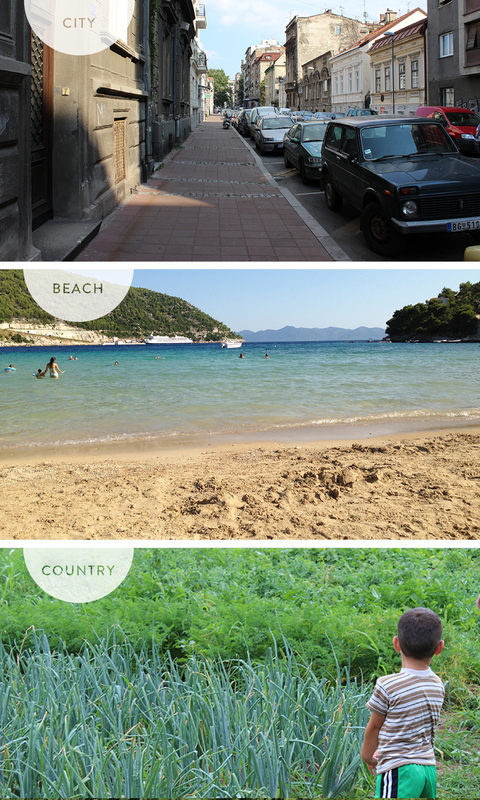 Whether you are a city, beach or country person each one has its perks and something to offer.